The photograph below was made about 1975 in the ultrasound laboratory at the Bowman Gray School of Medicine. It shows a Schleiren photography system for visualizing the actual shape and focal properties of an ultrasound beam. 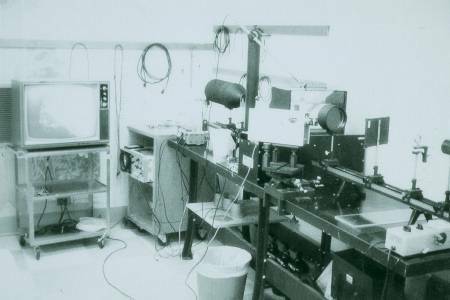 The optical bench at the right had a light source (far end) which was diffused into an "aquarium" containing degassed water, then focused to a point. The actual focal point was then blocked so that the only light reaching the end of the optical array would be light whose path was disturbed by the ultrasound beam which was directed into the water tank. 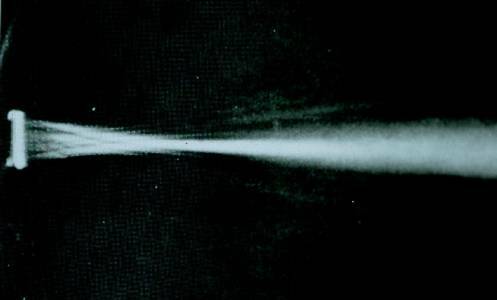 A stroboscopic light which could be synchronized with the pulsed ultrasound source allowed visualization of segments of the ultrasound beam depending on a slight delay of the firing of the light versus the "firing" of the ultrasound transducer. The entire beam length could be demonstrated when a CW (continuous wave) ultrasound source was used. The picture below illustrates the type of image which could be obtained using Schleiren photography. Notice the narrow focal zone typical of early transducers.